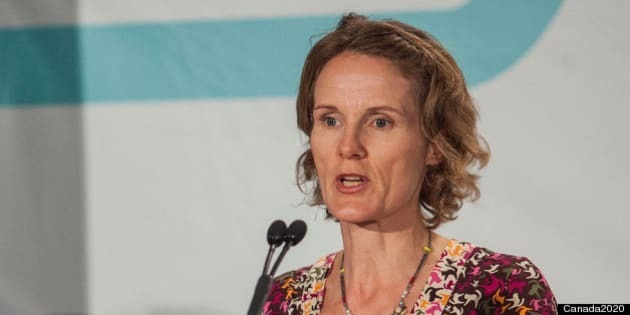 Diana Carney, the wife of Bank of Canada governor Mark Carney, has made some thinly-veiled criticisms of the Harper government’s environmental record and what she sees as a degradation of the debate about climate change in Canada. Prime Minister Stephen Harper and his cabinet ministers have repeatedly referred to carbon taxes as a “tax on everything” and commonly refer to it as the “job-killing carbon tax.” The Conservative Party previously supported a cap-and-trade scheme to help reduce carbon emissions, but officially came out against cap-and-trade in the 2011 election. “Since that time [Harper] has entirely turned his back on carbon pricing and deliberately obfuscated by conflating the federal NDP’s call for a cap and trade system with carbon taxation (‘a tax on everything’),” Carney wrote. Carney argued that “all federal parties have played a role in getting us to where we are,” noting that the Liberal government of Prime Minister Jean Chretien committed Canada to the Kyoto protocol in 1997 but did nothing to ensure the country would meet its commitments. The Harper government withdrew Canada from Kyoto in 2011, but remains committed to a 17-per-cent reduction in emissions from 2005 levels by 2020. Carney said there was no way for Canada to meet that target if government policies don’t change. Her report estimates that Canada will be able to reduce emissions by only three per cent by 2020 under the current environmental regime. “No government could be proud of such ‘achievement’,” Carney wrote. There has been plenty of evidence to suggest that the Carneys aren’t political allies of the current government in Ottawa, not least of which was the controversy surrounding reports that Liberal Party insiders had tried to recruit Mark Carney for the Liberal leadership race. The Bank of Canada governor has at times aired opinions that seemed at odds with the political leanings of the Conservatives, such as his declaration that the Occupy Wall Street movement was “constructive” and his public frustration with Canadian companies that have been hoarding cash in recent years instead of investing or hiring. The Canada2020 forum on the carbon tax brings together a number of people who are pushing for Canada to move forward on the policy, including an unlikely South Carolina Republican who stands out in his party for his position on carbon pricing. Bob Inglis, whose stance on the environment cost him his seat as a U.S. congressman from South Carolina in the 2010 election, has suggested that U.S. and Canadian conservatives could be convinced to support a carbon tax if it is implemented along with tax cuts in other areas. Diana Carney’s report acknowledges that implementing a carbon tax could have a negative short-term impact on the economy. But the report argues there could be an economic price to pay if other countries move forward with a carbon pricing regime and Canada is left behind.